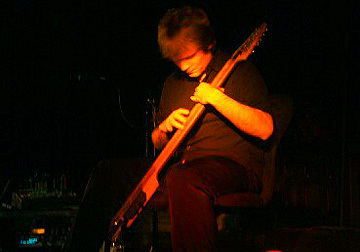 Seated to my right was the Chapman Stick connoisseur, though, to be honest, he only semi-expertly handled his chopsticks. DJ Kel sat to my left, graciously ignoring my prodding elbow and just-as-graciously recognizing my constant pleadings of "Pass your duck, please." Six of us, total, dined at a Jeff Towne-recommended University City restaurant. Pod is a most unique, fine eatery which encourages the ogling of and partaking in of one-another's delicious entrees. Chuck van Zyl, having not slept (again) for several days, had thoughtfully invited us all to a weekend-ending celebratory sort of thing -- another fine Gatherings concert featuring solo performances by Mr. van Zyl himself and Chop-not, but Chap-yes Jeff Pearce having taken place the evening before, along with a just-as-fine private-event (for WXPN donors) concert held the following afternoon. Rounding out this Sunday night dining crew was sound-engineer/chopstick-handling-expert Art Cohen. I can't say for sure, but I think I was invited along to dinner as a result of having provided sugarcoated donuts at the private concert. Whatever the reason, I was most appreciative for having been able to take a seat at the table and share the wrapping up of a lovely weekend (in style!) with such fine company. A restaurant note: Never have I ever seen such weirdly constructed desserts; or, for that, such odd "pod"-like restrooms. A walk in search of the latter resulted in eventual success, then a quick 180, and a mumbled, "Hmmm ... I think I'll wait until I get home." This Saturday night's Gatherings' appearance would be Pearce's fourth; all but one, I believe, have required hydroplaning over flooded roads in order to access. He's still got the power. But bring along fine company, share the rain, share the umbrella, walk through shimmering streets, continue up Locust Walk toward silhouetted spires, enter the sanctuary, shelter yourselves in stone, enjoy the smiles of recognition, the warm friends, the community; the rain won't matter. To the stage: Jeff Pearce would again carry with him his latest passions, spin wonderful yarns, display such graciousness, this time successfully selling us all on his compassion for the Chapman Stick, and, through this lovely instrument, languidly provide his receptive listeners with over an hour's worth of beautiful music. 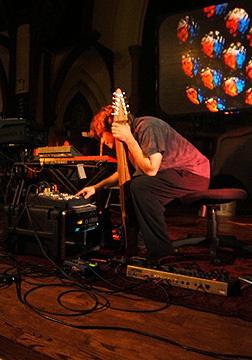 Mixing shorter pieces from his lovely recent release, "Lingering Light," with a half-hour long improvised string-caressed ambient set (which, in my opinion, ranks as heavenly as any the concert series has offered), Pearce again both charmed and seduced his audience. 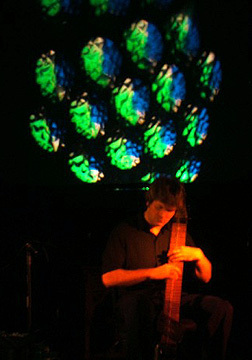 Throughout, projected animations created by Michael DuBois (of Pearce-collaboration "Luminous Dimensions" fame) drifted through spacious evolutions. To know the music is to know the artist. To experience the music of Jeff Pearce is to span a range of emotions. As part of the live experience, one smiles; one laughs; one cries. Performance winding to a close -- the evening would conclude with a rendition of the final piece from "Lingering Light"-- Pearce elaborated expressively on his appreciation of the Gatherings community, of his wondrous repeat ventures to experience its powers, of its positive personal effect, of the unparalleled connection he feels to it; to us. Right back at you, Mr. Pearce. The final piece of the evening was entitled "In the Silent Years to Come." Talking about having your cake and eating it too -- when the announcement was made that Chuck van Zyl would be providing an opening set at St. Mary's, I rejoiced. 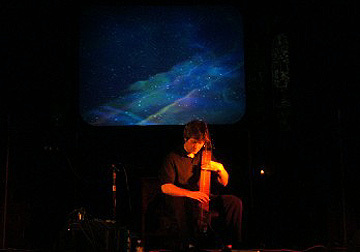 I've witnessed dozens of live performances in which van Zyl has participated (many of recent being his wonderful Ministry of Inside Things collaboration with Art Cohen), but, as Chuck himself has noted, solo appearances on his part have been extremely rare. A spacemusic fan can only ask for more. Van Zyl offered a gorgeous half-hour set. Upon personal discovery of the spacemusic genre, one of my initial acquirements was van Zyl's "The Relic," an admirable release (it's on my desert-isle-collection list) disclosing both beautiful themes and energetic sequences. His Saturday night performance would remind me of this CD. 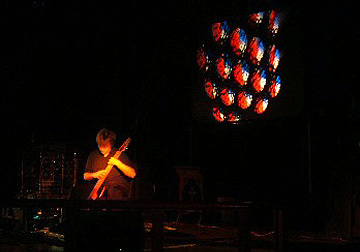 Yet another lavishing screen projection, this one produced by Terry Furber, mirrored van Zyl's sonic offerings. 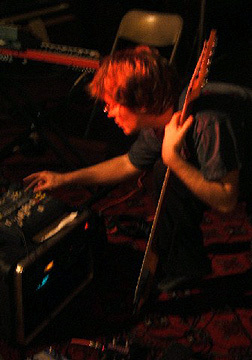 The following day's performance given by Jeff Pearce, held in a live-concert studio at public-radio-station WXPN, was in fact an event sponsored by donors whom support public radio and, in particular, STAR'S END. About two dozen donors were in attendance and each was graced in return with an equal amount of appreciation. 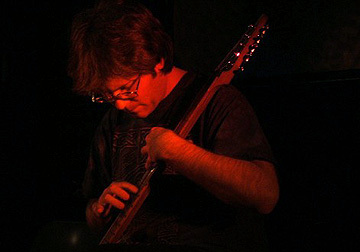 Pearce, between songs, invited questions and feedback; much discussion ensued concerning performance technique and concert experiences. 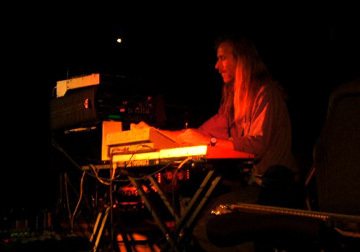 Chuck van Zyl hosted this event; after the performance he also expressed heartfelt gratitude to the group, for without listener support the finest radio show on the planet would not be. 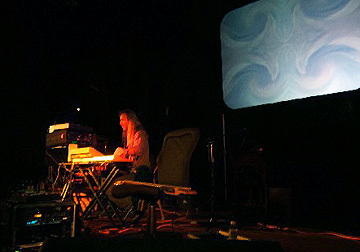 Chuck's words led to a free-flowing discussion concerning what public radio represented to each in attendance, and finally, of ambient/spacemusic expression. My role then kicked in, the official handing out of donuts. Soon after came my invitation to Pod.